Lorene Sunderman, age 96, of Clarinda, Iowa, entered into peace Friday, January 18, 2019, at Clarinda Regional Health Center, Clarinda, Iowa. Services will be held Monday, January 21, 2019, at 1:00 P.M. at Immanuel Lutheran Church, rural Clarinda, Iowa with Pastor Wade Brandt officiating. Visitation will be Monday, January 21, 2019 following the service with refreshments in the fellowship hall at the church. Inurnment will be held at Immanuel Lutheran Church Cemetery at a later date. Memorials may be directed to LWML or the Lutheran Hour. Memories can be shared with the family at www.ritchiefuneralhome.com. Arrangements were entrusted to the Ritchie Funeral Home, Clarinda, Iowa, where we 'Celebrate Life'. Lorene (Carlson) Sunderman was born to Theodore and Gerda (Hjalmstrom) Carlson June 22, 1922 in Page County, Iowa. She was baptized at age 6 in 1928. In 1936, she was confirmed at Nyman Lutheran Church, Nyman, Iowa. Her confirmation verse was Revelation 3:11 (I am coming soon. Hold on to what you have that no one will take away your crown). Lorene graduated from Essex High School in 1940. She married Wayne Sunderman July 27, 1940. She transferred her church membership from Nyman Lutheran Church to Immanuel Lutheran Church in 1940. Wayne and Lorene farmed east of Bethesda for 42 years. They retired and moved to Clarinda in 1982. In 2012, she moved to Westridge and made her home there until her death. 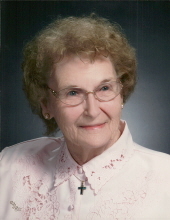 She was a faithful member of her church and the organization of LWML, LLL and the quilting ladies. She enjoyed taking tapes to people unable to come to church services. Lorene enjoyed watching the birds that came to her feeder. She enjoyed a small garden in later years always making room for a few tomato plants and cucumbers. She was a member of the Country Garden Club. Preceding Lorene in death were her parents; husband, Wayne Sunderman in 2005; brother, Henry Carlson; sisters, Anna Allen and Florence Smith; sister-in-law, Edna Carlson; and son-in-law, Don Warrick. Survivors include son, Larry Sunderman and wife Irma of Clarinda, Iowa; daughter, Peggy Rader and husband Jim of Colorado Springs, Colorado; three grandchildren, Randy Sunderman and wife Alise of Ankeny, Iowa, Brenda Toney and husband Bruce of Lincoln, Nebraska, Brian Warrick and wife Jennifer of Colorado Springs, Colorado; four great grandchildren, Aaron and Jeffrey Sunderman of Ankeny, Iowa and Alex and Megan Toney of Lincoln, Nebraska; brother, Richard Carlson and wife Dianna of Smithville, Missouri; sister-in-law, Ruth Sump of Clarinda, Iowa; along with many nieces, nephews and good friends. Refreshments and fellowship to follow the service in the Fellowship Hall of the church. "Email Address" would like to share the life celebration of Lorene Sunderman. Click on the "link" to go to share a favorite memory or leave a condolence message for the family.